This week I was back at Harvard University for the Think Tank on Global Education. This program was put on by the Harvard Graduate School of Education. As with all of my educational experiences at Harvard, it was an incredible learning experience. Dr. Fernando Reimers, Professor of Global Education, was the facilitator of the program and was incredible. He stretched us to become more global minded citizens. For all of the other programs I have been through I created top lists of everything I learned for this blog. This time, however, I am going to do it a little different. Dr. Brandon Wiley, Executive Director of international Studies Schools Network – Asia Society, was part of the program and really encouraged the use of Twitter for this professional growth opportunity. Well, those of you who know me know that I don’t need encouraging when it comes to Twitter. I had already been Tweeting it up. Dr. Wiley even told us there would be prizes for the top Tweeters. Well, you guessed it; I won! Therefore, I decided that a very fitting blog summary would be to create a top 100 Tweets List. Well, actually, it’s 110 because there were so many great tweets to the hashtag #hgseglobal that I had to pick 110. You can go to the hashtag and see them all. You will also want to check out the videos, pictures, and PowerPoint slides we posted to #hgseglobal during the program. The use of Tweeting with a hashtag is an incredible way hone in your thoughts and reflect during professional growth experiences! Not to mention, anyone could have been following along with us, from anywhere! You should try using Twitter at your next conference, professional development, or professional growth experience. 1. No ADHD kids in Finland. They call it childhood! 2. Let’s help our students be producers of goodness. 3. What if great thinkers in history had not had the opportunity to have a global experience. 4. Finland believes that a child’s job is to play. Kids start school at age 7. 5. 3 reasons for networks: relationships, resources, and resiliency! 6. We must have job imbedded professional development around global education for this movement to succeed. 7. What is the global education leadership challenge that you will make when you get back to your school? 8. All students must be globally competent – not just our most advantaged. 9. Global education could be a Trojan horse to reevaluating the competency of our educational system. 10. Leading together by working together. 11. Nothing human is foreign to me. 12. Need a school-wide approach to promoting global education; networks to share what works. 13. Living in a highly interdependent world is not an option, but being educated to do so competently is. 14. 1 in 5 Americans don’t see themselves as a global citizen. 15. 700 million fewer people worldwide in extreme poverty in 2010 vs. 1990. 16. Deep global competency cannot be achieved with “globalization lite” in the schools. 17. Novel idea: what if college readiness meant higher ed was ready for our kids as much as the other way around? 18. In Finland, “school readiness” means the school is ready to meet the needs of the student. 19. School needs to be ready for the student, not the other way around. 20. In Finland there is a great deal of trust (92%) in teachers by the public. In the US only 29% have complete trust in our teachers. 21. Learning a foreign language is one stepping stone to advancing global education. 22. As a leader you must find your entry points and your allies! 23. Great facilitation of learning answers the question: Why am I doing/learning this? 24. As leaders we must balance having a bold vision with what to do next. 25. Waiting for everyone to get on board is shirking your leadership responsibility. 26. It all starts with you! It is your Job to intrigue your leadership team on the global education topic. 27. Wherever you sit in the system, there’s a tendency to wait for others to lead. You can lead from wherever you sit. 28. Sometimes we proceed as if the US is the world, when in reality we are part of the world. 29. Find your entry point and begin there on the road to global education. 30. What’s your leadership commitment to moving global education forward. 31. Engagement is the key to having teachers lead this movement in global education. 32. We are talking about “bottom up” and “top down” leadership. How about we just talk about leading from where you are? 33. Good point, Byron. Requires leaders to REALLY know where they are to determine where they need to go. LISTEN, LEARN, PLAN. 35. Start somewhere. Even if it’s a small core group, start something. 36. Mindset is critical in leadership. 37. When it comes to global leadership, will your school be a leader, challenger, or spectator. 38. I have really been reflecting on the idea of having the balance between “bottom up” and ” top down” leadership for initiatives. 39. Students get it! Global education is engaging and relevant! 40. I need to remember this: I must facilitate learning for our teachers the same way I want them to teach our students. 41. There is no such such thing as normal when it comes to global education. 42. Twitter – the greatest professional development tool ever! 43. Foreign travel is great because it makes us uncomfortable and understand what it is like for our ESL (English Second Language) students. 44. You do not need to leave the classroom to bring the world to the classroom – technology. 45. We must nurture our teachers’ own global competence! 46. Sometimes a barrier is teachers talking to students about issues. We need to remove the barriers! 47. Rethink WHAT we think in foreign language classes. 48. Global education is not just about economics, it has to be about citizenship and global awareness! 49. “For Sale: Baby Shoes, Never Used.” Hemingway’s six-word memoir. 50. Global Competence Six Word Memoir: Kids Need Skills To Navigate Globally! 51. Another six word memoir: Kids Need To Navigate Shrinking World! 52. Love your interaction on Twitter…just the start of the conversation! 53. As educators, we are in the relationship business. 54. We must have an intentional/strategic curriculum for global ed, not just a few activities. 56. SAGE: STUDENT choice, AUTHENTIC context, GLOBAL significance, EXHIBITION to an audience. 58. The world is getting smaller and kids need the skills to navigate globally! 59. How do we create a sense of urgency around global education? 60. All students deserve the right to be globally competent. 61. Students must learn how to be able to take action. 62. Finland only takes the top performing 10% of students into teaching! 64. I love Harvard! I just spend the last hour discussing global education with individuals from 5 other countries! 65. 4 Rs: Rigor, Relevance, Relationships, and Resilience! 66. Personalize the relationship with students. 67. Don’t just try to do more, do more quality. 68. If you’re leading your people toward 18 initiatives of anything, you are headed for failure!!! 69. 18 skills of anything is too much! Why do we make leadership so complicated? 70. Adapting Professional Learning Communities for school leaders as well as teacher leaders – AWESOME IDEA! 71. The stars align when you can get the right groups together! 72. ABCs of Immersion: Academic Achievement, Bilingualism/Biliteracy, and Cultural Competence. 75. Do you agree or disagree? Monolingualism is the illiteracy of the 21st Century! 76. We need to be at the table so we are not implementing initiatives we were not a part of developing. 77. The way to support the common core in global education in helping students learn to take action is through CTE courses. 78. An important question we forget to ask: What does success look like. 79. In education, we need to stop using the “add & stir” approach! 80. Right now we are at a time of remodeling teaching & learning: tearing down, renovating, & redecorating. 81. Tridimensional global competency: Academic, Action, & Affective! 82. We must focus on our immigrant students’ assets instead of deficits. 83. Hanging world flags and doing multi-cultural days with different ethic foods does NOT make you global competent. 84. Just because you turn to chapter 8 doesn’t mean all the Egyptians died. 86. Professional development for global education must be differentiated. We must meet teachers where they are! 87. The phrase: “They’re in a different country!” is not an excuse anymore with the technology we have. 88. There is a fine line between professional development and professional discouragement. 89. Sometimes we need to rethink the “WHAT” of what we teach instead of adding more! 90. We must let the ownership of the story remain the student’s! 91. We must nurture our teachers’ own global competency! 92. We have to be careful of homogenizing our schools and not recognizing differences! 93. Students must gain capacity & disposition to understand and act on global issues. 94. We must use the community/world as resources for global education! 95. Many schools are technology rich, but technology user stupid! 96. Project Based Learning is a great place to incorporate global education. 98. Students need to know how to mine information from a global perspective. 99. Don’t pose a problem without stating WMWD: What We Might Do? 100. Education is a civil right! 101. Does a focus on “college & career” readiness narrow our view of education, perhaps at the expense of citizenship or other aims. 102. Knowledge & expansion of worldview is more important than knowing a second language. 103. Do you need to become nationally aware to be a globally aware person. 104. Developed countries don’t hold the market on global education. Tech is democritizing ed & we can all learn from each other. 105. Need a school-wide approach to promoting global education; networks to share what works. 106. I don’t think we have to “know” multiple languages to be globally competent; I think we need to care to “learn” languages. 109. You do not become a leader by trying to be a leader. You become a leader through your actions. 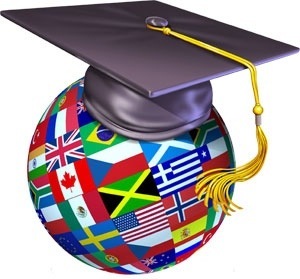 I used to think global education could be taken care of by having a curriculum, a few special programs, a special class or two, world language classes, and maybe taking a few students on a foreign trip. Now I know global education is much more! The skills and insights students can gain from interacting with people of different nations and cultures is critical as America engages more intensely with an increasingly global marketplace and interdependent world. As an educational leader, I must lead the charge to help the students I serve to have a high quality global education program. A great global education program is multi-faceted, fully job imbedded professional development for the teachers, and has transdisciplinary themes. Finally, I believe all students have the right to deep global competency!